All residents at St. Joseph Institute learn about breath work: what it is, how to do it, and why it helps. But breathing is one of the easiest practices to overlook. We breathe without thinking about it, and we often “forget to breathe” when we experience stress. When our residents finish treatment and return to their homes and lives, they will surely experience stress. 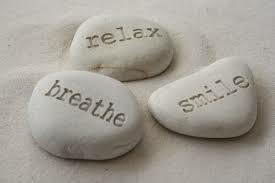 The simplest and easiest way to combat this stress is to practice breath work, daily if possible. As residents learn, our body’s nervous system can be divided into two parts: somatic (under our control) and autonomic (involuntary, beyond our awareness). By controlling our somatic nervous system through breath work and other stress-reducing activities, we can calm our autonomic nervous system. When we forget to take care of our stress, our bodies can actually forget how to relax. Deep, slow, relaxed breaths activate our ability to rest and digest. Being relaxed and centered reduces our cravings for food, alcohol, and/or drugs. As we relax, we have a better perspective on life and can more easily prioritize our goals and tasks. Being relaxed awakens our intuitive, feeling nature, allowing us to act from our heart center instead of reacting to the world in “fight-or-flight” mode. Of course, even when we “remember to breathe,” it can be difficult to practice breath work. We’re stressed because we’re busy, and taking time out to breathe instead of getting work done means we’ll get behind and therefore feel even more stressed, right? Solution: 5 minutes. Five minutes is five times better than zero minutes, and taking five minutes to practice breath work when you feel your shoulders tightening or your anxiety growing can help tremendously. The more you practice noticing and relaxing your breath, the more quickly you will become aware when it changes due to stress. Breathing exercises come in endless variations and can be used to increase alertness, prepare for sleep, or simply relax. The exercise below, breathing for relaxation, comes directly from St. Joseph’s educational materials. Find a comfortable position. If you’re sitting, put both feet flat on the floor. Continue breathing in this manner, simply focusing on your breath. Begin to imagine that when you inhale, you are breathing in peace and relaxation. When you exhale, imagine letting go of tension and stress. Notice what is happening inside your body as you breathe. b. Using your internal sense of hearing, notice what your breath sounds like. c. Using your internal sense of touch, notice what your breath feels like. Doing this breathing exercise even five minutes every day will help reduce stress, reduce cravings, improve sleep quality, and stabilize your nervous system.